The Internet in Cuba: Paquete Semanal, S. A. A legitimatized "Paquete Semanal, S. A." could distribute Netflix content in Cuba today. To the extent that we are allowed to see it, Cuba's plan for the Internet focuses on connectivity in homes and public places and support of areas that are considered socially important like education and health care. Even if Cuba is patient and leapfrogs current technology, a large investment will be required in service of those goals. As shown below, real-time entertainment (audio and video traffic) accounts for over 70% of North American, fixed access, downstream traffic during peak hours. 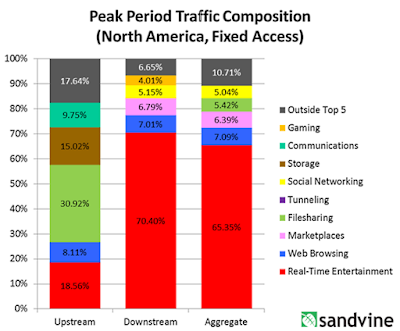 Netflix is the individual leader with 37.1% of downstream traffic. The infrastructure investment needed to support digital entertainment is beyond Cuba's means, but, necessity being the mother of invention, Cuba has outsourced digital entertainment to El Paquete Semanal. The organization supporting El Paquete has grown organically and efficiently distributes content in a timely manner. There is demand for their product and El Paquete may be Cuba's largest private employer. That is the good news, but is El Paquete officially legal? And isn't it's viability dependent upon copyright piracy? Ironically, El Paquete must also suffer from piracy by end users. I don't know if they worry about that today or just tolerate it and rely on fresh weekly material for their revenue. Regardless, if prices rise after the removal of the wholesale piracy subsidy, there would be a greater incentive for end-user piracy. Normalization of relations between the US and Cuba will eventually require elimination of the piracy subsidy that makes El Paquete viable. When the negotiations on digital piracy take place, Cuba should consider the strategic role El Paquete plays and find a settlement that allows it to remain a part of the Cuban digital infrastructure. (There might even be competing "paquetes semanales" -- with the government acting as a wholesaler that negotiates deals with content owners). Netflix entered the Cuban market shortly after December 17, but that seemed to be a symbolic step, with no prospect of profit. It will be many years before Cuba is able to support the streaming of Netflix content, but a legitimatized "Paquete Semanal, S. A." could distribute Netflix content in Cuba today. In this post, I have focused on content distribution, but the Cuban film and creative communities could be a source of Spanish language content for Netflix and others to distribute in other nations, including the US. I had suggested earlier that Cuba could be a source of content for Google and it's been reported that Cuba is being considered as a location for "Fast and Furious 8" -- might we see Google, Amazon, Netflix and other production centers in Cuba one day?